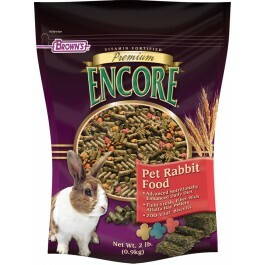 At Brown's we understand that your pet is more than just a hobby, it's a member of your family. 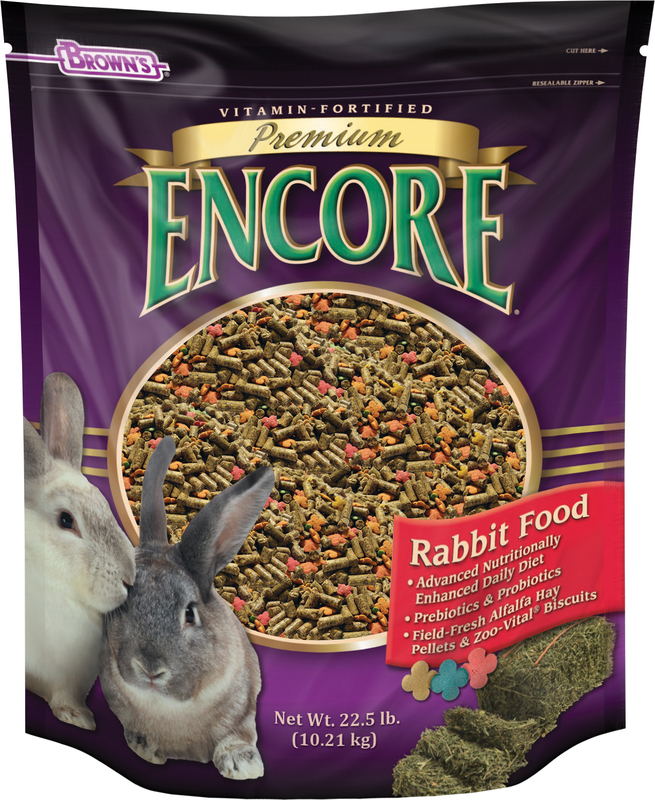 we've created this unique vitamin-fortified, premium food to satisfy the hunger cravings of your rabbit. At Brown's we understand that your pet is more than just a hobby, it's a member of your family. 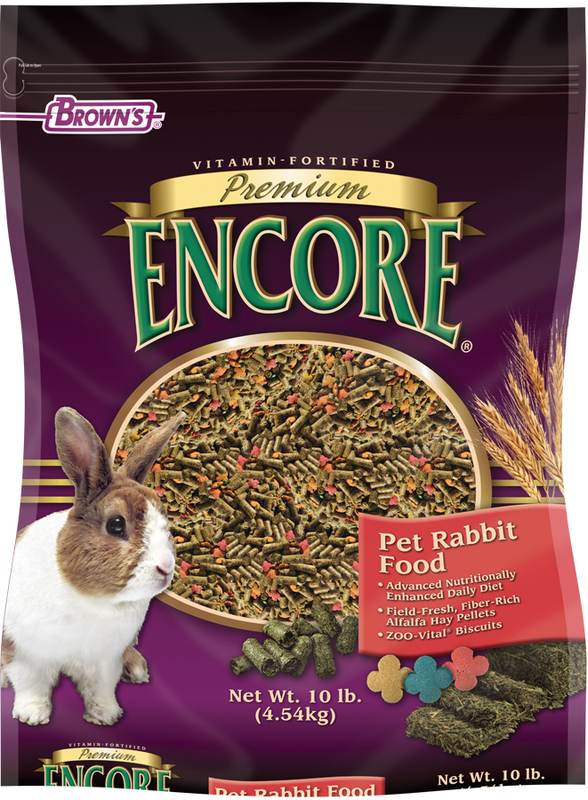 We've created this unique vitamin-fortified, premium food to satisfy the hunger cravings of your rabbit. 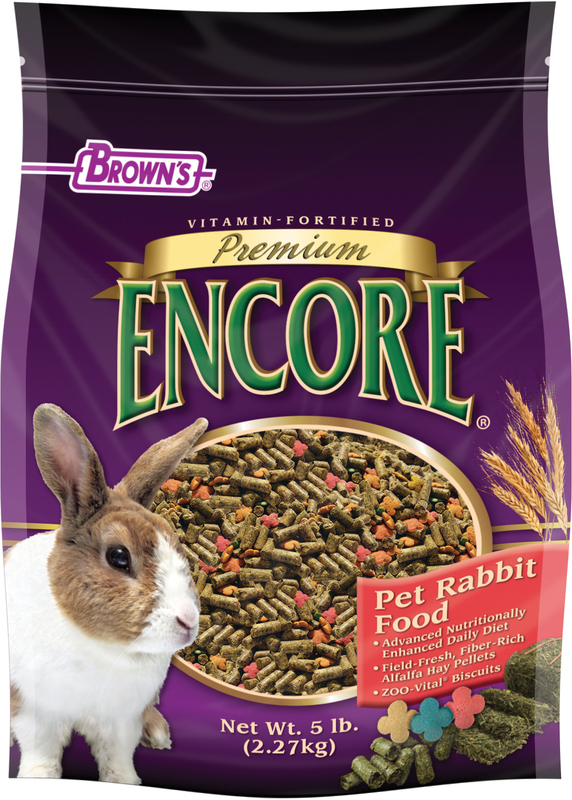 Encore is a nutritionally enhanced daily diet with fiber-rich and field-fresh alfalfa hay. We use only natural preservatives, plus we've added our ZOO-Vital biscuits. 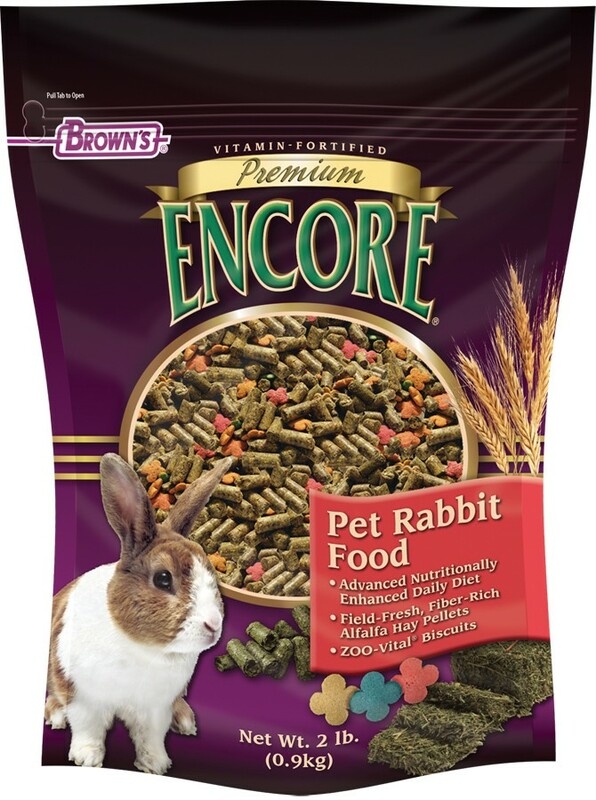 These biscuits are colorful, vitamin-packed food shapes that make feeding time exciting, tasty and fun. 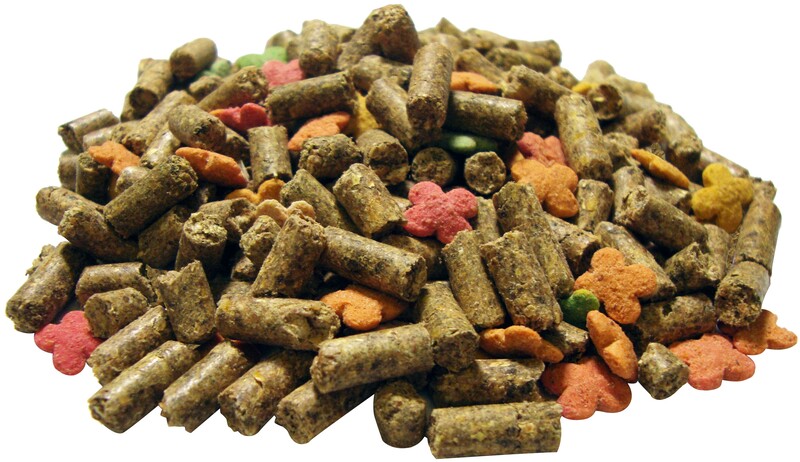 Dehydrated Alfalfa Meal, Wheat, Wheat Middlings, Wheat Flour, Ground Corn, Ground Oats, Ground Barley, Corn Gluten Meal, Dehulled Soybean Meal, Soy Oil, Dicalcium Phosphate, Brewer’s Dried Yeast, Cane Molasses, Calcium Carbonate, Algae Meal, Fructooligosaccharide, L-Lysine, Salt, Vitamin A Supplement, Vitamin D3 Supplement, Vitamin E Supplement, L-Ascorbyl-2-Polyphosphate, Thiamine Mononitrate, Menadione Sodium Bisulfite Complex, Vitamin B12 Supplement, Choline Chloride, Manganese Proteinate, Iron Proteinate, DL-Methionine, Zinc Proteinate, Sodium Selenite, Dried Bacillus subtilis Fermentation Product, Dried Aspergillus oryzae Fermentation Product, Dried Lactobacillus acidophilus Fermentation Product, Dried Lactobacillus casei Fermentation Product, Dried Bifidobacterium thermophilum Fermentation Product, Dried Enterococcus faecium Fermentation Product, Dried Aspergillus niger Fermentation Product, Biotin, Folic Acid, Lecithin, Mixed Tocopherols (a preservative), Yucca schidigera Extract, Rosemary, Carotene, Artificial Banana Flavor, and Color Added (Titanium Dioxide, Red #40, Blue #1, Yellow #5, and Yellow #6). Vitamin A (min) 5,000 IU/lb. (B. subtilis, A. oryzae, L. acidophilus, L. casei, B. thermophilum, E. faecium, Aspergillus niger “in descending amounts”) Contains a source of viable, naturally occurring microorganisms.